Hello, it’s the crazy couple again, still knee-deep in our kitchen renovation! It’s March, and we’ve since removed the last of the cabinets from this wall. The giant gaping hole in the wall above the range has been patched, and I primed the whole wall just to give it some extra oomph. 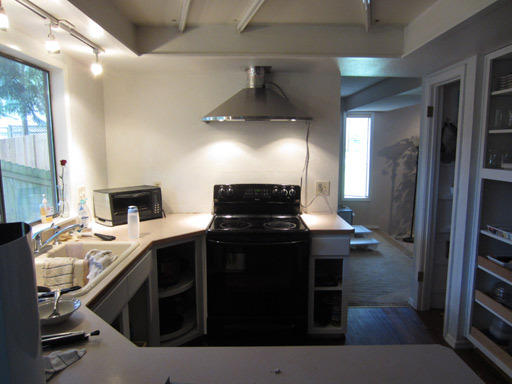 This is the wall “before” the range hood went in. We let a pro handle this one. Ta-da! I always dreamed of an awesome range hood, and this Zephyr-brand range hood is pretty deluxe. We bought it from Bothell Home Appliance (in Bothell, WA) and the two dudes they sent had it installed in about an hour – if you live in the Puget Sound area, say wut up to them for me, they’re my favorite place for appliances. But what’s with that cord? Hooking up the electrical to anything other than an outlet is outside the scope of their services, so alas, we have a long dangling cord for now. Also, the ventilation duct remains exposed because the stainless steel covered provided by the manufacturer is about a foot or so too tall for the space. I get why they provided a super long cover, but I hope they offer some sort of cutting service because this is incomplete until we figure out a solution. In the meantime, though, the appliance itself works GREAT! 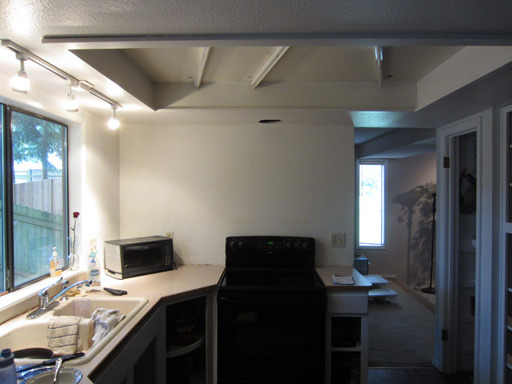 Super quiet and super effective ventilation for our twice-daily cooking. Hooray!! Any guesses as to what we will work on in March? If you guessed “the backbreaking labor of tearing up our own floors”, you’re correct!